The innovative design of this Morse 4 wheel drum truck provides extra safety, ease of use, and versatility. With Morse ergonomic drum hand trucks you can load and unload a heavy drum with ease and move a drum quickly and easily in narrow aisles. The four wheels fully support the drum's weight, so maneuvering is easy. It turns on a dime too. 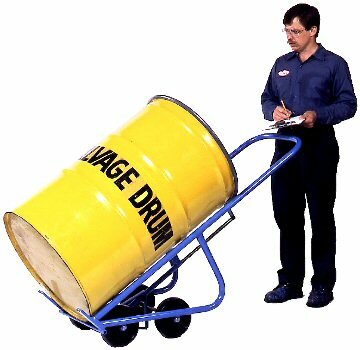 You can move a drum onto and off pallets, and position a drum for dispensing with a portable 55 gallon hand truck. When you're done, the drum truck stands upright by itself for space saving storage. We also sell 2 wheel drum trucks, 30 gallon drum dollies, Wesco drum trucks, and drum palletizers. With this ergonomic Morse 4 wheel drum truck, you can load and unload a heavy drum with ease and move a drum quickly and easily in narrow aisles. 4-Wheel Drum truck like model 160, but with spark resistant parts made of monel. Do you need to move a drum across rough terrain? The 4 wheels are mounted outside this drum truck's frame to provide a wider, more stable base. The inflated tires help move the truck carefully over rough terrain.